By the time Cadets reach the Land Confidence course in their second week, they’ve already completed the Land Navigation test as well as the Army Physical Fitness Test – tell-tale signs that they are prepared enough to complete LDAC. Cadets must shrug off the stress they’ve faced thus far and power through intimidating obstacles to complete the Land Confidence portion of LDAC. At Land Confidence Cadets negotiate an obstacle course, a confidence course and a rappelling wall. In the mud pits of the obstacle and confidence courses they squirm through the dirt in their ACU’s with barbed wire inches from their face. At the rappel wall they firmly plant their combat boots perpendicular to the ground in order to scale down 37 feet to level ground. All this is done to assure they have the capability to complete such extreme tasks should they confront them in combat. “It is a confidence course; it is designed to make them feel like they are invincible—like they can conquer the world,” said Master Sgt. Trey Chislom of 12th Regiment from the University of New Mexico. 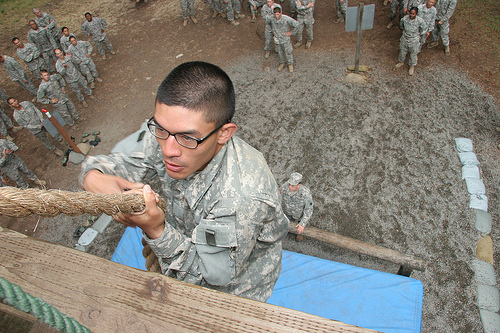 The confidence course is comprised of over a dozen different stations where Cadets must overcome their fears as they shimmy up vertical ropes, slide inverted while hanging from horizontal ropes, walk across 30-foot-high wooden beams and hurdle over logs. These tasks are done individually, but squad members remain at each site before moving to the next obstacle to cheer on their fellow Cadets. At one site, appropriately designated “The Tough One,” Cadets vault over a log to then attempt to ‘j-hook’ themselves up a rope to a wooden fixture. The ‘j-hook’ requires Cadets to weave the rope between their boots, allowing them to launch their body to the first level a few feet at a time. Cadets find this initial rope-climb to be the most difficult. Next, they walk across beams spaced a foot apart to a ladder where, once up, they climb back down a rope wall. “It’s nice once you accomplish it,” Newman said. Squads fuse together to race through the obstacle course. On various parts of the course they crawl under barbed-wire, zig-zag through a wooden maze and jump over an open pit. The event is timed, but Cadets are assessed based on their leadership and team skills rather than their agility. No matter how quickly a Cadet can complete the lane, they still have to wait for their entire squad to cross the finish line before the clock will stop. As Officers who may soon be leading Soldiers in combat and be responsible for more than just scores at a training site, the Cadets realize how important it is to have squad cohesion throughout this obstacle course. As physically draining as the course may be, it is through these challenging situations that the Cadets’ confidence is built and their mental strength, a critical Soldier trait, is sharpened. See our video on the Confidence Course here!